This is the time for everyone to report in for their actions of the last week of the March-A-Long. For those new to the blog, this is a 15 minute per day challenge where YOU (and I) attempt to do some ‘quilty stuff’ each day. You can chose to use my daily format for reporting in, or just give a general synopsis. Did you make your goals for the week? Comment below or use the inlinkz tool below. I will leave links open until the end of March. 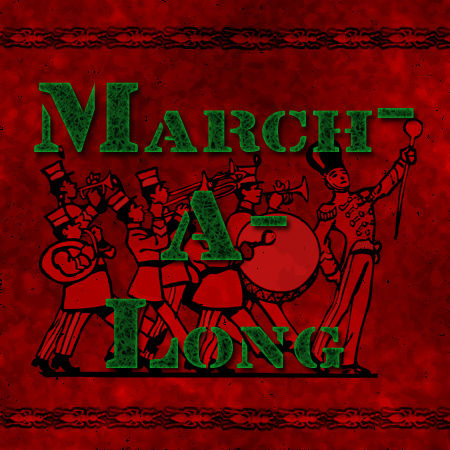 If you have a March A Long blog post, link it below. This past week for me was completely recouperation week, and I enjoyed every introverted minute of it! Just my kind of style, albeit slightly lonelier than last week. For each week that you participate in the March A Long, I will put your name in a drawing to receive at least Leah Day’s beginning Free Motion Quilt book patterns called from Daisy to Paisley. This drawing will be done at the end of the month and now I have to go find my stack of items I’ve been thinking about giving away. I’m counting the week from Sunday through Saturday. How was your fourth quilty week? Here’s mine. Sunday, I rested. And I listened to an audiobook, and I sewed down triangles, and strips, and triangles, and strips. At the end of the day I actually got organized on the sewing table which helped out the rest of the week. Monday, I did sew a few strips down this day, getting a lot closer here to getting done. Tuesday, I sat down for at least an hour and knocked out the remaining strips for the hexadaisy project. AND someone from the guild came over and dropped off two trash bags full of some kind of fabric. Wednesday, I think this day I worked about 5 – 10 distracted minutes on my embroidery. Thursday, I ripped out all the paper on the back of the hexadaisy quilt pieces, and then placed them on my design wall. I am sure that just the placement on the design wall took 15 minutes alone. Friday, I promised I was going to work on quilting, but in the end just got my bags of the donated fabric into my room, and actually did not look at them at this time. I promised myself to work 30 minutes on Saturday instead – and to work on the final embroidery piece for the LAST BOM for the guild. Saturday, well that is today, and this morning it was way more interesting to do dishes and laundry, and food shopping, and cleaning up my desk than doing the embroidery. I got myself so worked up over this embroidery thing that I haven’t put any effort into finishing it. BUT to count for my 15 minutes, I spent about 45 minutes going through both bags of fabric, organizing into trash, give to the garage sale for the guild, small pieces to iron to keep, and large pieces to wash and then keep. One fabric was worth the whole sorting thing as I love it and there’s about a yard of it. There are other ‘nice fabrics’, and other fabrics that are low quality, but I like the pattern of, and other fabrics that are probably exciting for other people, but I just can’t get into them, but I am going to see if they’ll round out my stash in any way and become practice projects or something. And maybe I’ll embroider and do my stationary bike type of thing at the same time if possible. Who knows. And then tomorrow is the gathering all the emails and posts together day, and I do have some Easter plans, but I will work on getting your reports up to speed as well. Here are a few photos of this week’s progress and things I’ve been doing. Actually most of the pictures are heavy towards the beginning of the week. Now here’s a chance to inLinkz for the last week of March. So, I just touched the wrong thing on my iPad, and there went my week’s details. 15 minutes plus each day, that’s my last March-a-Long report. Thanks for doing it, Darla! O my goodness!!! What is that hexadaisy? I’ve never seen anything like it. It’s spectacular and looks impossible. I’ve just recently discovered you (a few days ago). Thanks Didi for commenting. I have the pattern from craftsy and it’s just 3 different types of triangles that have paper pieced rings on them. I haven’t sewn them together so I don’t know how accurate everything will be yet, but I am excited to get it together. I have a history of doing long complicated projects over short ones, and particularly like the ‘geometric’ although I don’t hold myself to that completely. I sewed on 3 days this week, more than an hour each time. Worked on the quilt I started in a class last fall. Even though I didn’t do the suggested 15-minutes-per-day workout, I “exercised” my quilting muscles more this March than I have in months . . . and, Darla, I really appreciate your encouragement toward making that happen. Thanks! 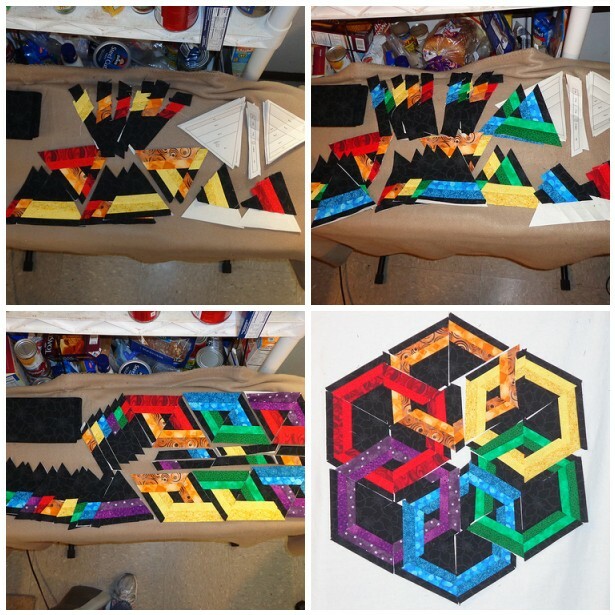 Darla, Your hexadaisy project is WOW! Love the bright colors and your organization of the parts. Hey Darla – I did lots of quilt show work this week (which I counted but maybe that is cheating?) and…tada! I finished a quilt, too. It took hours and hours of quilting, which is par for the course because I didn’t think it would take so long. Thanks for organizing the march-a-long!!! I totally bombed out this week. The only day I sewed was Tuesday, when I made my Trivet. If you count all the week’s allotted 15 minutes per day together I got at least that much sewing time, but I didn’t do something every day. I keep loving the quilt you’re working on! I did my “at least” 15 min. a day this week!